Cat Chat With Caren And Cody: Nature's Variety Winners & A New Bloggie Friend!!! Nature's Variety Winners & A New Bloggie Friend!!! She is an adorable girl, isn't she? Oh wow -- I'm ecstaticat!!! =^..^= I think you have my address already, but I can send it to you again if you need it. @Julia you are one LUCKY lady my friend!! I think you need to play the lottery!!! lol. I have your address for sure! :) Congratulations! Thanks for entering! Concatulations to the winners! And Athena is already one of my regular blog visits - I enjoy her lots! Athena is a doll! ConCATulations for the winners! We'll drop by to say hello to Athena right away. She's so pretty!!! Congratulation for all winners !!! Gee, what a nice surprise and a great way to start the day, thanks! I sent you an email with my address. I also went by to visit that cute Athena! Congratulations to the winners! We eat Nature's Variety and we love it! Concats to the winners; hurrah! We're following Athena, she's a gorgeous ladycat! Yay!! Thanks for all of the congratulatory greetings to the winners!! YAY!!! Also thanks for making Athena feel so welcome!! Congrats to all the winners! And, it's great to meet Athena. She's a beauty!! Thank you for thinking of our Chica and sending her purrs. She continues to improve. What a sweet face! Going to the blog now! Oh congrats to all the winners! That is awesome! And of cours we will head over to meet Athena - we love making new friends! @Cats of Wildcat Woods-that is FABULOUS NEWS!! keep that good news coming and PLEASE give Chica a HUGE kiss from us! thanks all for visiting Athena!! what a pretty lady- she looks so sweet! Ms. Z.
Congrats to the winner! What a beautiful kitty too. We think Miss Athena is so adorable. Congratulations to the Winners!!! We are going to visit the beauty, Athena, right now! I'm so glad that you got to work with Nature's Variety, they're a great company. I made it to the Iams/Eukanuba event and had a blast. Jen is such a sweetheart & she's tiny! @Oskar yes they were wonderful! I was surprised when they contacted me. They are great! I am sooooo glad your conference was a huge success!!! Congrats to the winners!! And we've met Athena!! She is terrific!! Concatulations to the winners! Theys all great cats! Me has gone and met athena! She is a most beautiful cat! BTW - Kozmo and one of our squirrels is having a chasing war! Kozmo chases the squirrle and he yells at Kozmo! Then the crows come and they chase Koz! I was just starting to really grow fond of Athena over the past few weeks when I read that sentence that's the kiss of death: "Doggies welcome too." Sad to say, she has dropped a notch or two or six in my high regard. Congrats to all the winners!!!!!! 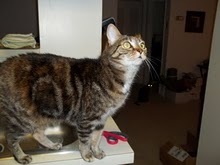 We have already met Athena and think she is a very pretty kitty !!!!! @Nellie that is hilarious! Kozmo is so funny! @Tillie yes she is a very pretty kitty!! It looks like Patches should be entering contests over here--yummies to be had! @wildcats, yep it is sooo true, you can never have too many friends! @Carrie that is so nice of you!!! Thank you! Yep, Patches needs to stop by and enter contests! Thanks so much for the award but I don't post about them any longer. I am soooooooo flattered though! Thank you!!!! Congratulations to the winners! Athena is a very pretty girl. We'll pop over to say hello.